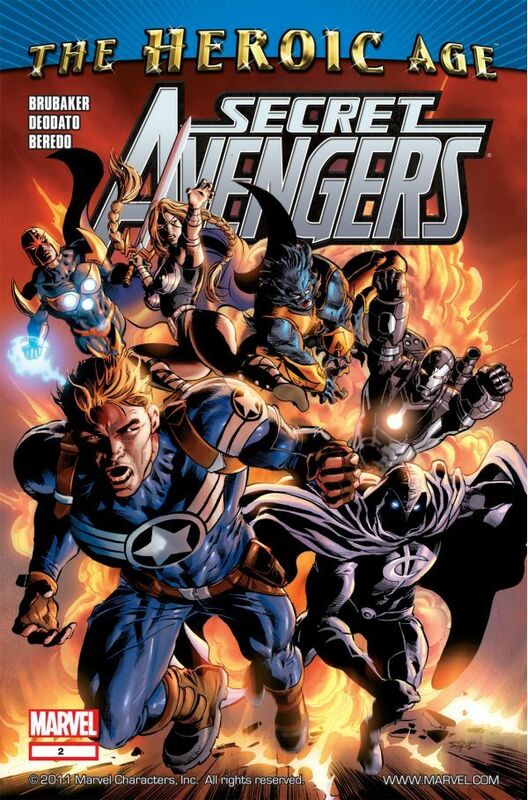 As Secret Avengers #2. “Secret Histories: Part Two” begins I find myself asking…who is that man in the eye patch? Will Ed Brubaker confirm who it might be? Or will I be left howling in a Fury about who this villain might be? Someone has hacked the Secret Avengers roving headquarters and Sharon Carter is not happy about it at all. What she discovers is that the burglars were using stealth tech that seems very S.H.I.E.L.D.like. Carter follows the trail of the “Crown of Tentacles” that was lifted from the team’s headquarters. Meanwhile on Mars, Steve Rogers seeks Nova at an abandoned Roxxon mining operation. And his team is attacked by stealthy soldiers who do not allow their capture so they can protect the Lords of Shadow. But these soldiers may be the least of Steve Rogers’ worries. And the eye patched man appears again, this time in a S.H.I.E.L.D.like jumpsuit with serpents! Here is the deal, I am guessing that this eye patched man is somehow connected to Nick Fury. He looks like Nick Fury, he moves like Nick Fury and he mostly dresses like Nick Fury. But I really do not know if he is Nick Fury! But I am willing to keep going to discover who this man is. Okay, fair warning I have five more issues in this run so I was going to keep going no matter what. Who are you eye patched man? You look like a hero and have tech and agents that appear to be on S.H.I.E.L.D. model. But would Nick Fury ever actually fight Steve Rogers? I mean other than Secret War. Oh and rather than Original Sin! Oh man Nick you have a pattern! There was a lot of fighty fighty in this issue. And I did not hate it. Have I ever mentioned I really like Mike Deodato art? A lot has happened since the release of Secret Avengers #2, like Steve Rogers got old and Ant-man became Scott Lang again and War Machine became Iron Patriot. So I am left with a lack of tension about heroes I know are going to a certain point five years later. But I still find myself enjoying the adventure.